The SSAP is a dispersed community of Episcopal women over 50 years old who are living the Christian life within vows of simplicity, creativity, and balance. We are lay and ordained. We are single, married, partnered, and widowed. Some are retired; some work part-time; some are working in full-time positions. What is our relationship with the Episcopal Church? The SSAP was recognized and accepted in 2009 as a Christian Community under the canons of the Episcopal Church by the Standing Commission on Religious Orders and Communities of the House of Bishops. We are also recognized by, and included in, the 2016 International Book of Anglican Religious Communities. order and a religious community in the Episcopal Church? Religious orders have the traditional vows of poverty, chastity, and obedience. Religious communities may choose other vows, as we have. Our vows are simplicity, creativity, and balance. The organization of both orders and communities in the Episcopal Church must meet national guidelines, and both must have a Bishop Visitor. Our Bishop Visitor is the Right Reverend Anne Hodges-Copple. Sisters in religious orders usually (but not always) live together in a monastery or convent. Sisters in religious communities may live dispersed, in their own homes, as we do. Life within a religious order or community is a religious vocation defined by a rule. How is the SSAP different from a parish? The SSAP is not a parish. Full membership and participation in an Episcopal parish are required of all Annas, if their health permits. The SSAP reaches beyond the parishes. Our ministry is with those who are unable to worship in a parish church or participate in parish life. We are shifting the locus of “being church” from the parishes elders have left behind to the places where elders now live. The SSAP provides sacramental and pastoral ministries in ecumenical communities of faith located in nursing homes and assisted living facilities. We are developing creative ministries with the very frail and those suffering from dementia. What is the mission of the SSAP? Anna is the only woman of old age named in the New Testament. According to the Gospel of Luke, the parents of Jesus went up to Jerusalem after the birth of Jesus to present him in the Temple and to offer the appropriate sacrifice. They were greeted by two elders, Simeon and Anna, who recognized the infant Jesus as the promised messiah. Sisters in the SSAP are called Annas. The name Anna is linked with each member’s personal name at the time of her regular vows. What are the ministries of the SSAP? Our corporate ministries focus on elders. We are committed to our own Godly aging as witnesses to the mystery of the incarnation in every season of human life. Teams of Annas have formed congregations with elders living in care and participate with them in a full celebration of the Holy Eucharist each week. Individual Annas are involved in ministry with the young in parishes, with foster children, and as caregivers in their own families. We are part of the Elder Network of the Diocese of Atlanta. How did the SSAP get started? Seventeen women, lay and ordained, founded the Society in 2005, under the leadership of the Rev. Nan Baxter, who was at that time the Episcopal Chaplain to Emory University. In 2007, after provisional and novice years, the first sisters were fully vowed, and the Society was incorporated in the State of Georgia. That same year, the Bishop of Atlanta transferred responsibility for three congregations of elders at Emory/Wesley Woods from the Emory Campus Ministry to the SSAP. The Rule took shape in 2008 and was adopted in 2009. Later that year, the House of Bishops recognized the Society as a religious community in the Episcopal Church. In 2010, the Bishop of Atlanta gave permission for the SSAP to establish a house, and after a brief sojourn in a facility at St. Bartholomew’s Episcopal Church, the Annas raised money and bought a chapter house near Emory University. The Anna House serves as a place of meeting, of prayer and worship, and of solitude and retreat. What is the process for becoming an Anna? The process begins with a communication of interest, either to one of the sisters or through the website. The Director of Provisionals and Novices guides aspirants through an application process. After consideration of the application and an interview, an applicant may be admitted to a provisional year of discernment during which she participates in the life of the community. After a year or two as a Provisional, the process continues with a year as a vowed novice. Novices spend a year “trying on” the vows and continuing their participation in all aspects of the life of the community, testing their vocational call. If the vocation is affirmed by both the Council and the Novice, regular annual vows may then be made. 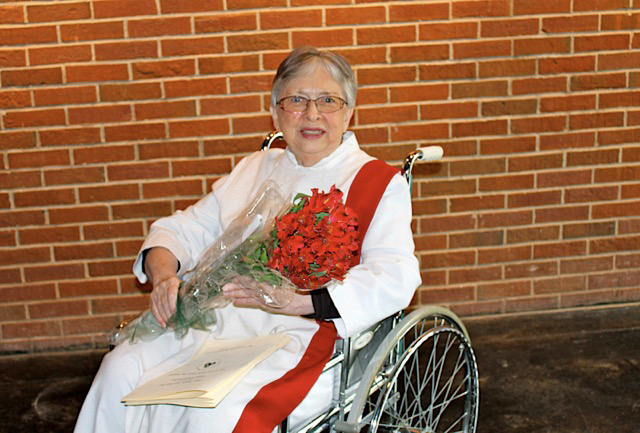 After five years of annual vows, the Sister may apply to take vows for life. Leadership and governance of the SSAP is vested in a Council of six Annas, chaired by the Superior. Two Council members are appointed by the Superior, and four are elected, including the Superior. Terms are three years, except for the Superior, who serves for five years. How many Annas are there? In 2018, there are 33 Regulars, of whom 19 are vowed for life. Two Novices are in discernment. Fully vowed Annas are called Regulars because each year they create their personal rule or regula which reflects the ways in which they will be living out the vows of simplicity, creativity and balance. What does the three sided symbol mean? The triskelion is a very ancient symbol which predates the Christian era. It is found, among other places, on entrance stones of burial mounds in Ireland. Early Christians appropriated the symbol to mean the Trinity, but it also carries other threefold meanings, such as body/mind/spirit and past/present/future. The form of the spirals communicates motion and energy. Our triskelion is our signal color, red. The vestment or habit of the society is a cassock/alb covered by a scapular with a red band down the left side. Life vowed Annas have a small triskelion embroidered on the red band. Each Provisional, Novice, and Regular makes a yearly pledge for the support of the community. This financial pledge is in addition to the pledge she makes to her parish. The Society also receives financial gifts from friends and supporters. What if an applicant lives outside the Diocese of Atlanta? Most Annas currently live within the Diocese of Atlanta. Some have moved and are now living further away, in North Carolina, Kentucky, Arizona, Illinois, Tennessee, New Mexico, and Maine. Our Constitution provides for the inclusion of women outside of the southeastern Province IV and for the development of groups of Annas in other provinces of the Episcopal Church. We have not yet begun this expansive stage of our development, but we are open to the Spirit’s promptings as we receive expressions of interest from women outside our area.